The leading and underlying dairy industry indicators are starting to show improvement. Exchange rates, import statistics, export statistics, and cheese pricing are all trending in a favorable way for the U.S. dairy industry. The key exchange rate for the New Zealand Dollar vs. the U.S. Dollar is trending to more normal levels. There is, however, still a good way to go if it is to reach the 2008 levels. As a result, cheese imports from New Zealand appear to be coming off their highs which were reached from the end of 2008 through the first quarter of 2009. 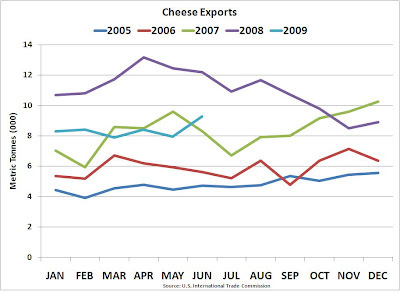 Cheese exports, although not at 2008 levels, are improving and are at levels that were only exceeded in 2008. Will they continue to rise? It all depends on the global price of U.S. Cheese which is largely determined by exchange rates. 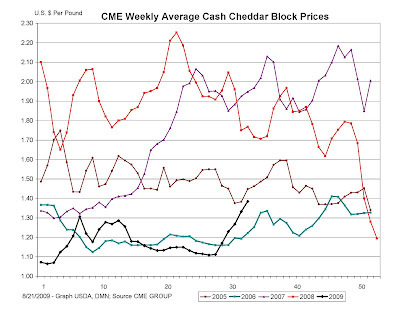 The increased levels of support prices has had a dramatic impact on cheese prices on the Chicago Mercantile Exchange (CME). Little of this, however, will influence August Class III prices due to the lag in National Agricultural Statistical Services (NASS) cheese pricing. 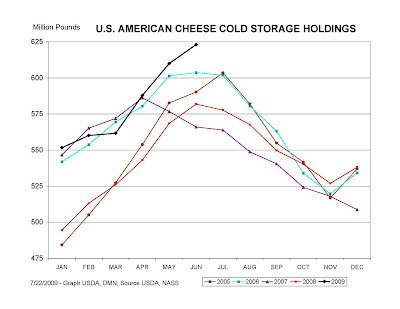 There is one statistic that is not positive - cheese inventories are at historical highs. These inventories will have to be worked down before real price increases in cheese can develop through supply and demand. The USDA released their monthly Livestock, Dairy and Poultry update on August 19. These forecasts do not attempt to make adjustments caused by exchange rate fluctuations. They predict increases to $11.53/cwt for Class III Milk in the fourth quarter of 2009. To see a significant change in milk prices, the many domestic actions to reduce cow numbers will have to be accompanied by favorable exchange rates so that U.S. Cheese is financially attractive on the world market. The U.S. buys it's cheese on the world market. The Federal Milk Marketing Order (FMMO) pricing model uses formulas to determine the prices paid to the milk producer. These prices are based on a system which takes the prices of the end products like cheese, butter and dry whey and subtracts the cost of making these products to arrive at the value of the raw materials (the milk and milk components). The higher the cost to make the product, the less the raw material is worth. In most competitive manufacturing environments, the cost to make the product typically drops from year to year as improved production techniques and automation improve the efficiency of the operation. It appears that manufacturing efficiencies are not being realized in the dairy industry. Between the beginning of 2007 and the end of 2008, the make allowances in the formulas increased dramatically. While international events have put great financial pressures on the cheese markets, the Cheese processors are getting a bigger allowance. What does this mean for the milk producer? Regardless of where the cheese and butter prices are, it takes $.8149/cwt out of every milk check. Protein is worth $.11/lb less! Butterfat is worth $.07/lb less! Other Solids are worth $.04/lb less! Class III Skim Milk is worth $.60/cwt less! Class III milk is worth $.81/cwt less! It is obvious that these make allowances were increased when milk prices were high, and there was money to spread around. However, now that the dairy markets have collapsed there is no downward change to the make allowance. To have a successful national dairy industry all parts of the production and distribution chain must become brutally cost effective. It seems like the milk producer is the one feeling all of the pressure and all the pain.